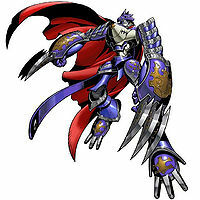 A Beast Knight Digimon whose whole body is clad in Chrome Digizoid armor. As a result of moving at incomparable speeds, the opponent is deceived when it witnesses it as a phenomenon similar to a mirage. 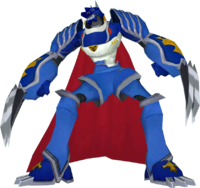 Its Special Moves are firing crescent moon-shaped shock waves from its hands (Double Crescent Mirage), and a superdreadnought-class strike in which it concentrates its body's energy, then fires it from the mouth on its chest. (Full Moon Blaster). 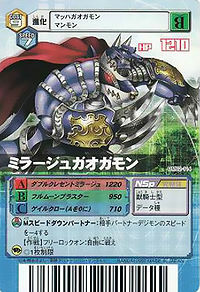 Also, it can run through like a hurricane, instantly cutting the opponent to pieces (Gale Claw). 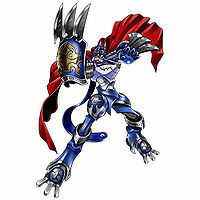 A Beast Knight Digimon whose whole body is clad in Chrome Digizoid armor. As a result of moving at incomparable speeds, the opponent is deceived when it witnesses it as a phenomenon similar to a mirage. 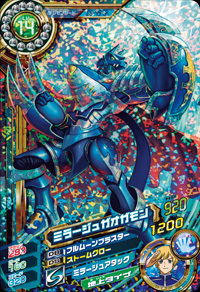 Title: 「神速の蒼き狼」 — "Swift Blue Wolf"
Gao is the sound of roaring. 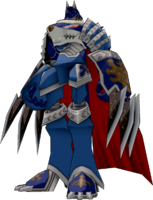 Ga is for Garuru which is the sound of growling. 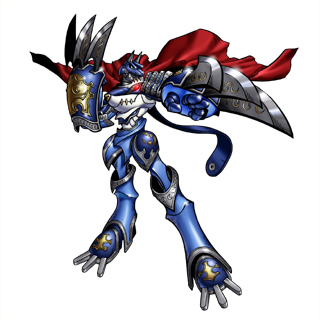 Anime/Manga Digimon Savers: "Resurrected Digivices, A New Shining Light"
Double Crescent Mirage  ダブルクレセントミラージュ Daburu Kuresento Mirāju Fires crescent moon shaped shock waves from both its hands. 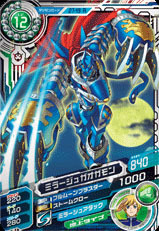 Full Moon Blaster  フルムーンブラスター Furu Mūn Burasutā Concentrates its body's energy and fires a superdreadnought-class blast from the opening on its chest. 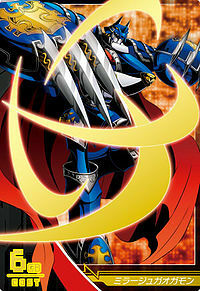 Gale Claw  ゲイルクロー Geiru Kurō Rushes up like a hurricane, cutting the opponent to pieces in an instant. Howling Cannon  ハウリングキャノン Hauringu Kyanon Unleashes an ultrasonic wave attack with its howl. 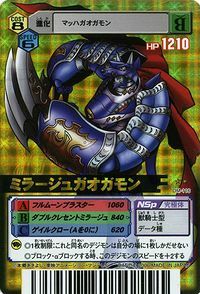 Quick Move  クイックムーブ Kuikku Mūbu Claw attacks the opponent using its high speed. 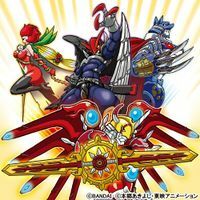 Sonic Move  ソニックムーブ Sonikku Mūbu A faster, stronger version of Quick Move. Mirage Gaogamon is the partner of Thoma H. Norstein. 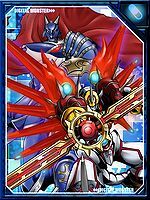 Gaomon Ultimate Evolved to Mirage Gaogamon to help fight Bio Thunderbirmon, Bio Coatlmon and Bio Stegomon. 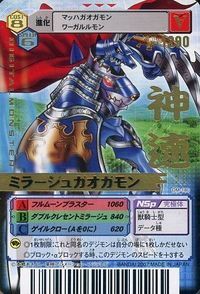 Can be evolved from Mach Gaogamon above level 53, attack 235, and speed 280. 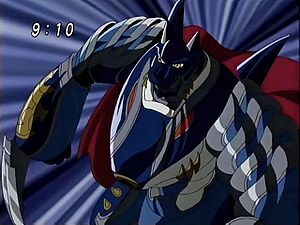 Mirage Gaogamon is the evolved form of Nicolai Petrov's partner, Gaomon. 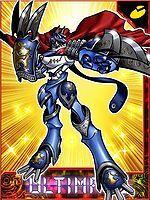 It is also an obtainable Digimon which is evolved from Mach Gaogamon or Were Garurumon It can also be obtained as a collectible card. 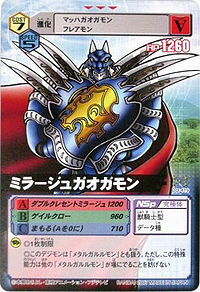 Its card is part of the Gaomon Evolution (ガオモン進化 Gaomon Shinka) set. 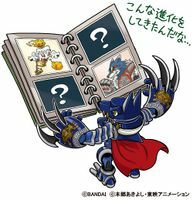 Evolves from Gerbemon, Lilamon, Mach Gaogamon, Rize Greymon, or Whamon. 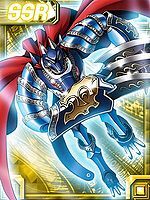 Evolves from Mach Gaogamon, Mammon, Mega Seadramon, Rize Greymon, Shawujinmon, Tyilinmon, or Yatagaramon. 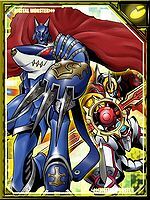 Can Burst Evolve into Mirage Gaogamon: Burst Mode. 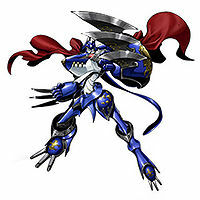 Mirage Gaogamon evolves from Mach Gaogamon. 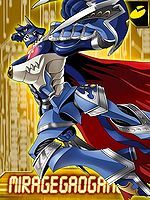 A Beast Knight Digimon whose entire body is clad in Chrome Digizoid armor. 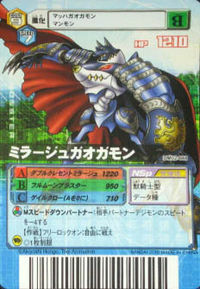 A Beast Knight Digimon. 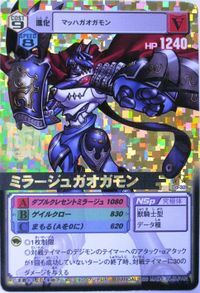 Because it moves at unparalleled speeds, it appears as a mirage in the opponents' eyes. 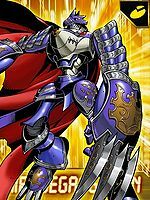 A Beast Knight Digimon whose entire body is clad in Chrome Digizoid armor. It tears the enemy apart with the gigantic claws on both arms. 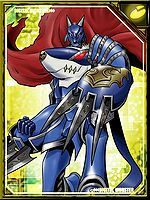 A Beast Knight whose whole body is clad in Chrome Digizoid armor. It moves at unrivaled speeds, causing the enemy to mistakenly perceive it as a mirage. 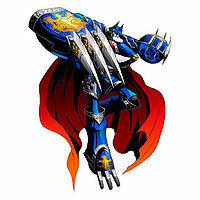 Its two arms are equipped with the Gale Claws, which allow it to slice the opponent apart in an instant. 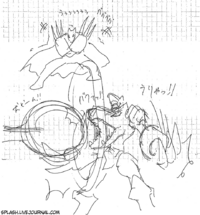 ↑ Digimon Savers: "The Burst Mode of Thoma's Determination"
This page was last modified on 24 March 2019, at 00:31.